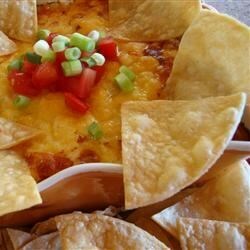 "This quick, easy chili cheese dip is a little different from most, and is sure to be a favorite!" Spread cream cheese on the bottom of a microwave-safe dish. Spread a layer of chili over the cream cheese. Finish with a layer of shredded cheddar cheese. Microwave for 5 minutes or until the cheese melts. Serve with spicy nacho tortilla chips. This was great-and so simple! I used a 7x11 baking dish and also baked in the oven at 325 for 20 minutes instead of using the microwave. If you want something quick and easy and tastes good, this is a good dish to make!